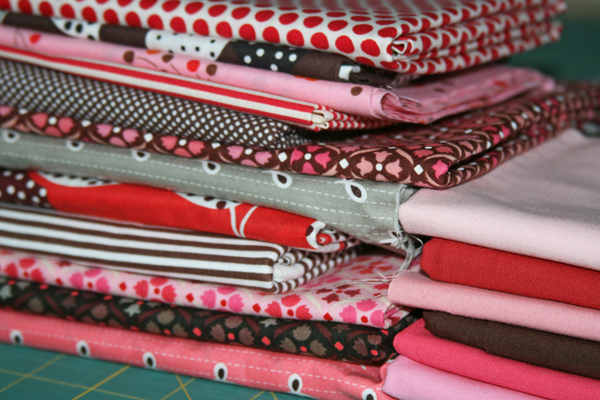 To begin, I typically select a stack of printed fabrics I want to use for my quilt. Then I usually add in several coordinating solids. I find that I typically use about 7-12 printed fabrics, along with 2-6 solids, depending on the size of the strip quilt. 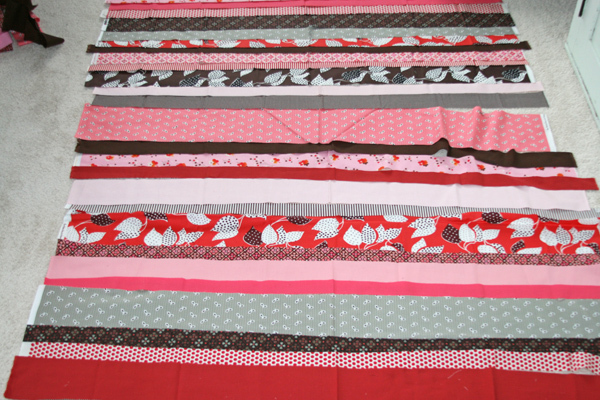 I like variety in my strip quilts, and this provides enough fabric to use 1-2 strips of each fabric. Next you’ll want to cut these fabrics into several strips, cutting selvage to selvage. 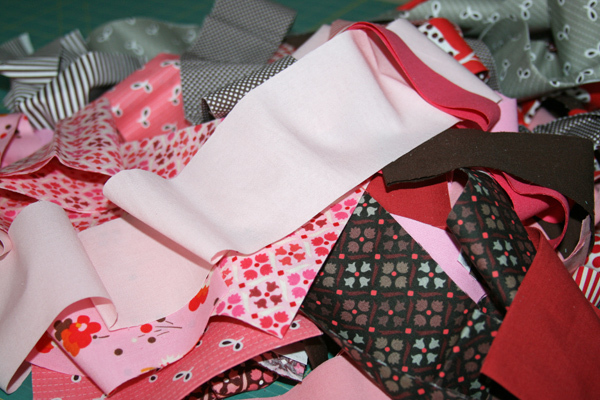 To start, I usually cut 1 strip of each fabric – 2 of those I’m particularly fond of. I try to vary my strip widths – cutting widths from about 1 1/4″ to about 6″. I usually select a couple of my favorite fabrics to use as feature fabrics, and I cut the wider strips from those fabrics. As you can see in yesterday’s Strawberry Seas strip quilt, I cut wider strips of the mermaid and octopus prints because I wanted those to be a focus. In this quilt, I cut wider strips of the FMF seeds and dotted leaves prints. Now you’ll start to lay out the strips to find a layout you like. I usually start with the wider strips, leaving space between each wide strip. Then I fill in with the remaining strips. Once you’ve laid them out, you may find that you need to cut a couple additional strips. I try to vary the placement of the fabrics and the colors, so often there’s a lot of rearranging of the strips until I find a layout I like. At that point I typically take a photo to make sure I still like the layout – it’s often easier to see the layout as a whole in a photo. I stack the strips in a pile from top to bottom, and then I sew them together in pairs – sewing the first two strips together, setting those aside and then sewing the next two strips together. Repeat until all pairs have been sewn together, keeping your strips in the order you’ve set. You’ll likely find that your strips aren’t exactly the same length, especially if you’ve mixed in several different fabrics, and that’s ok. They’ll be trimmed up in one of the next steps. 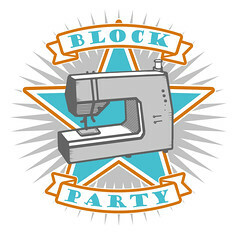 Now you’ll want to repeat this process, sewing the first set of pairs to the second set. You’ll now have sections of fabric strips that each contain 4 strips. At this point I iron all the seams in each section. (I wait to iron until this point because I’m not a fan of ironing, and I find this method to be faster, but of course you could certainly iron after sewing the pairs together). Now you’ll trim each of these sections. I find the section with the shortest strip to determine the length you’ll cut each section to. For this particular quilt, I found that my shortest length was about 42.25″. Cut the selvages off one side, and then cut the other side at your determined length – 42.25″ in this case. Once all the sections have been trimmed to the same length, pin the first section to the second and sew. Repeat for remaining sections. Then sew each larger section to the next section until they’re all sewn together. Iron these seams and then stand back to admire your quilt top! Since you’re cutting your strips from selvage to selvage, the maximum width of your quilt will be somewhere around 42″ or so (assuming you’re using 42/44″ width quilting cotton). 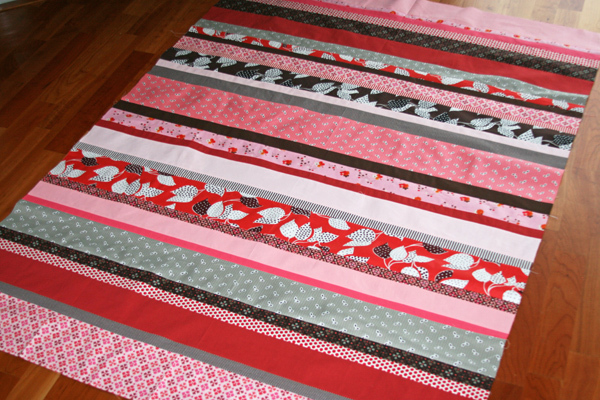 With a quilt of this width, I like a length of around 55″ or so (but of course this is all personal preference!). Smaller is nice too (as in the Flea Market Fancy baby strip quilt I showed the other day). You can trim your strip sections to a shorter length and use the trimmings for a pieced backing. When you initially lay out your strips, it can be hard to determine if you have enough strips to make a long enough quilt. Once you have your strip sections sewn into 4-strip sections, I like to lay out all the sections again and measure the quilt length, taking into account the seam allowances. If you find it to be too short, you could add in a strip or two to get to your desired quilt length. I like to use a medium/large width strip for the top and bottom. This way if you need to trim up the quilt once it’s all sewn together, you’ll have enough space to be able to trim without ending up too close to the seam. Any questions? Leave them in the comments and I’ll respond there! This entry was posted in Posts about Quilts, Tutorials and tagged denyse schmidt, flea market fancy, quilt, quilt top, strip quilt, tutorial. Bookmark the permalink. Thanks for the great tutorial and photos. I especially like your tips on sewing the pairs of strips together to minimize distortion, and also, the tip on using larger widths for the top and bottom. Hope you and baby are feeling well! Great directions. I always take a picture of my layouts either for quilts or scrapbook pages so I can make sure I like the look before I put it all together. Nice to know someone else does that too! Thanks, Ashley! Being a “confident beginner”, I have a question: Someone mentioned to me that you should sew in different directions, like when you’re sewing the strips, do you start at the “top”, and then switch and start at the “bottom” so all your seams are not going in teh same direction? I think she said it prevents bowing of the strips? Your quilts are always so nice and even. I do this when quilting, but I don’t when sewing my strips together. I think that you can avoid the problem you’re talking about when you sew the strips together in pairs. Love this process tutorial. This is my kind of quilt! Not difficult technically, but a great way to showcase fabric and quilting. Something that you can actually make in a reasonable amount of time. Thanks for the great tips about colors/widths/etc. Thank you so much for sharing, your quilts are so lovely. Thank you so much! This will be so useful in helping me know where to get started! Thanks so much! There also seems to be so much you can do to change these up- like cutting it in 2 and inserting a vertical strip. Or making a square piece and cutting into fourths before turning each piece and reassembling. My mind is churning with variations! Thanks so much for this tutorial. I tried to make one of your strip quilts once. In my ineptness I did not realize I needed to cut the strips selvage to selvage. Well, you can imagine what happened! The strips stretched! I had to recut the whole thing and do a different pattern. I turned out well, but it was not what I set out to do. This is great as I was about to start my first strip quilt today…perfect! One question about ironing the seams: do you press them to one side or open them up? Thanks so much; this is a great help. I iron all my seams open, but it really is a personal preference. Thank you for the tips! (and the pictures) Hoping to start my first strip quilt this weekend! Yay! Great tips! Especially using the bigger pieces on the ends so you can trim. Thanks! How perfect! I was just going through your website last night to see if you had a tutorial for one. I have been seeing them off and on here and thought, “I really want to make one too!” They are so simple yet so cute! I was wondering how you do it…you must have read our collective minds. Thanks so much. I have fabrics all pulled for a strip quilt, but definitely have noticed distortion in past projects. Thank you for the tip! Awesome colors! I plan to use this technique soon. Just might fall in love with it as I love stripes & polka dots. Plus might fall in love with the “ease” of creating! I LOVE the pink-ness of this quilt!! I adore the swap I received from you and hope that you have also received your pink coriander 🙂 thanks again, Ashley! Hello, I found out about your website a couple of weeks ago. I love your tutorial for the strip quilt. I will surely try it out! Where do you live, Lindsay? I’m sure I have enough fabric for both of us to make several of these! I love the look of strip quilts. I’ve seen table runners made of strips done in a QAYG method. Has anyone tried doing that with selvage to selvage length strips? You always amaze me with your tips. I’ve done a strip quilt in the past but certainly did not put nearly as much thought into the design as you have here. I think it’ll go better in the future thanks to you. Since you go selvage to selvage how much of each fabric do you recommend getting? At most, I’d say you’d need a 1/4 yard cut of each print (and you’ll certainly have extra, depending on how many prints you’re using). Thanks a lot… but if you could only add your preferred or suggested way of quilting it, it would be great. Thanks again. So cute!! What a great tutorial! Thanks for sharing. Man wouldn’t I love to raid your fabric stash! Ashley, What batting do you use? I typically use Warm & Natural or Warm & White. I love you site, your tutorials and your talent. Appreciate you doing this….I have been wanting to do a strip quilt and even though it seems simple a little guidance is great….you gave me lots to think about so this WILL be easy! What a wonderfully simple project! I adore the colors you put together for this project. And I love the varying widths, especially the really wide and really narrow, which give the quilt more contrast and eye appeal. Thanks for sharing your methods here! This is a very good tutorial. Clear, concise directions, appropriate photographs. Great work. Thanks for the tut. Love your quilts and ideas. Very fun. 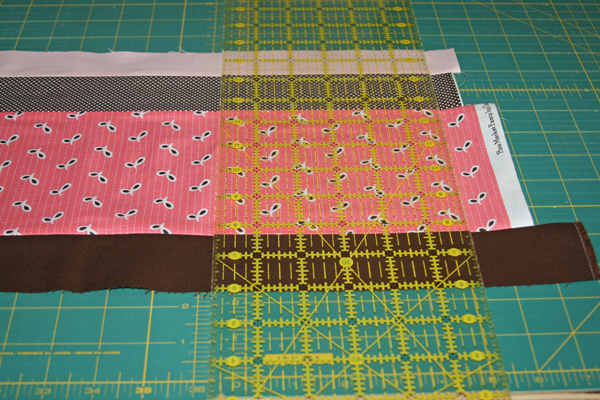 I always love looking at your strip quilts…hoping to make one of my own soon…thanks for the pointers! I use two large cutting mats side by side. However, if I only had the one, I think I would probably either fold the strip section in half and trim, or I might lay it out and use a washable marker to draw a line at the 36″ mark, then move that over and measure the remaining length from that point. This was very helpful to me. Thank you so much for sharing your process! Have a super weekend. 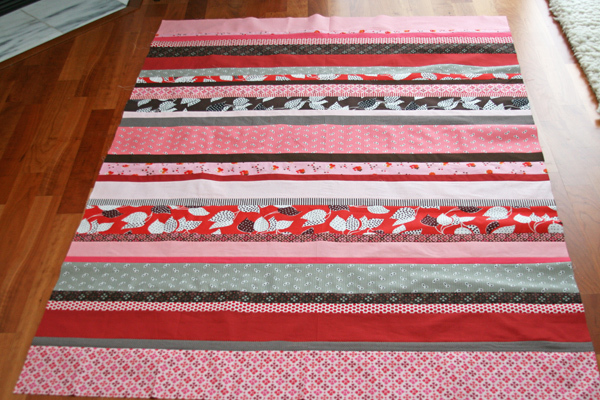 I really would like to make a strip quilt for my daughters’ bed…which is a full sized bed. If I just sew two full-length strips end-on-end, will that look ok? Not sure what to do about that. I checked it out…way better than anything I would’ve come up with-I love it! Thank you SO much! I was also thinking of making a strip quilt in a full size or there abouts. I was thinking about inserting vertical strips of whatever the backing would be in btwn the regular strips. (does that make sense?) so I guess it would look like 2 smaller strip quilts attached with a vertical band? But i’m unsure how this will look? I like the order of the regular strip quilts and the picnic one seems to be a lil crazier than what I’m going for with this particular quilt. any opinions? I’ve been making strip baby quilts for gifts (they’re fun & easy). For a few, I’ve sewn the strips vertically, added some solid black strips in the mix & ended up with some very “Amish” looking quilts (love the look). Thank you, thank you, thank you for this tutorial!!! What do you do when a print is *obviously* crooked? Do you keep to the integrity of the grain of the fabric and just let the print look wonky, or do you get creative with your cutting to make it look straight? I haven’t found that to be a problem too often (luckily! ), but when I do, I’ll usually make a small adjustment to the way I cut so that it doesn’t appear super crooked. If that doesn’t fix it, I’d probably skip that fabric and save it for a different quilt. fantastic! just what I have been waiting for. I love the look! Do you wash your fabrics before you sew or after? I don’t prewash any of my fabrics, so once the quilt is done, I just throw the whole thing in the wash.
I’ve been admiring your strip quilts and just started quilting this year. Thanks for the lovely tutorial, I’m going to try it soon! I am brand new to quilting and this looks like the perfect beginner project! However, how do you do the batting and the other side? I am clueless! Thanks! Very pretty little quilt. It is so much fun to read your replies to our queries. I also love Warm and White batting. The quilts lie so flat and they wash well with it. Just enough crinkling to look a bit old-fashioned. This is my question as well. I just finished my first twin size strip quilt and am wondering if I should add some vertical stitching before finishing it. Did you ever get an answer? Thanks so much for this. After having a baby, I’m just now getting motivated to sew and quilt and knit again, so I love this idea. I’m not real big on complicated piecing at this time. Thank you for so many lovely things to look at! Your tutorials are great. Please could you tell us how you bind your quilts. I am useless at hand sewing them neatly and wondered if there was another way? As a fair beginner, I’m always looking for the easier quilts to help me learn. Thank you very much for your help. It means alot. Thanks so much for these great directions! I shared this on my blog! Thank you Ashley, for this wonderful tutorial! I am going to make one like this! Thank you for the tips you added too! Makes life so much easier. Thank you so VERY much for this. Stumbled upon your blog and can’t thank you enough. Daughter is working on G.S. gold award and needs donated quilts. Has to teach a class and this one will be perfect for beginners. I think I’ll try one myself! Thank you for the wonderful tutorial. I made my first strip quilt and am in love with it. I posted a link to your tutorial in my post, I hope you don’t mind. Thank you for the inspiration! I love this tutorial! I am so excited to test this out. It is so modern. Thanks for the wonderful tips. I love the look of strip quilts and would like to make one as my next project. 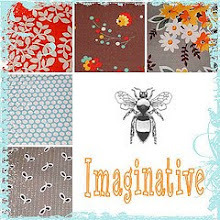 The only thing is that I don’t have enough scrap fabric to use, so I’ll be purchasing the fabric for my quilt. Can you advise how much to buy? I can see how these quilts might become addictive! I was so pleased with how my attempt turned out that I am desperate to make more, playing around with different fabrics. We have just found out we have our own little one on the way, so providing all goes to plan, I can see plenty of these gorgeous quilts on my horizon! I’m in the middle of a strip quilt right now and came to check your post again for the process of starting to sew them together. Love your tip to sew 2 together at a time! I would like to do a stripey rag quilt for my queen sized bed, too, but I haven’t found a pattern yet. Has anyone found anything? Take a solid color such as white. Make them the same size as your strips. Sew on both ends of each strip to reach the width you want. This concept works best if you make the center strips different lengths. Your quilts are beautiful–thanks for sharing! I made one of these out of dog fabrics for my nephew. In the class for it, we layed out the backing and batting and sewed the strips onto them one at a time, therefore when the last strip was done it was quilted (finished!). A row cut into fringe on each end gave it a finished look with binding on the sides. Very quick gift to make. Thank you! I’m still working on branching out from symetrical quilts and your tutuorial really helped me to feel comfortable with the cutting and sewing process for a strip quilt with various sizes. I love how my quilt turned out and feel much more confident to try more random patterned quilts. I love the quilt, but want to make it for a twin size bed. So the width would need to be around 70-80″ wide. Is this possible? Would I just try to sew two of the same strips together? Would the seam in the middle look weird? Any advice would be appreciated. a good rule of thumb is to divide the strips into thirds. For this particular quilt, I would cut one of the pieces in two and use the other piece for the middle. I would be sure that I flipped the pieces so nothing matched. So that is more like 25-25-50, but it will sure look better than a seam down the middle. I also would like to know the answer to #81’s question please. I’m thinking the strips would have different lengths to make it look better than just one seam straight across. Also, would you mix up the fabrics instead of one fabric sewn together? If you sew the pieces together, would you make a straight seam or would you miter the seam? I’m a very new quilter so I realize these may be silly questions for the majority of people, but I really am not sure. Please give me some help! I LOVE this quilting thing that I’ve recently gotten into and can’t seem to learn it fast enough!!!! I appreciate anything you can tell me. Thank you so much. I would love to see how the strip quilt is assembled. Thank you. Thank you for this wonderful tutorial. Several years ago I made a “strippy” quilt, following the instructions in a kit I bought at a quilt show. Unfortunately, they didn’t say anything about sewing the strips in different directions, so after about 12 strips there was severe bowing and I had to rip out every seam. 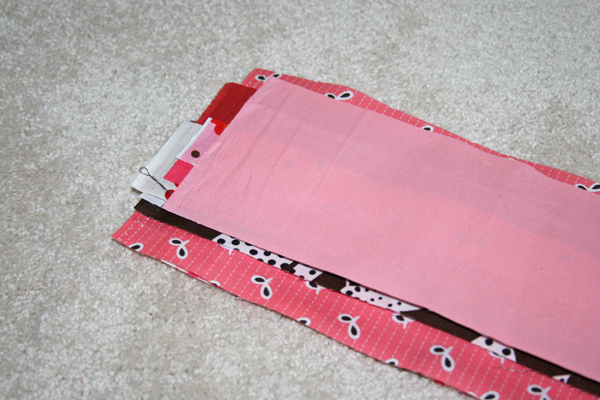 I read somewhere on-line to sew each new strip in the opposite direction — I tried that and it worked perfectly. I appreciate your sharing an alternate method for avoiding the dreaded bend and I shall try this soon when I make another one of these fun quilts to hang above our new bed. And thank you for all your inspiration and help here. Your work is always impeccable! I really want to make a strip quilt for my son, but want it to be a Queen size. I have only done quilting on a small basis and have no idea what is the proper procedure to make a larger strip quilt. Can you please tell me how to plan for a quilt that size? Thank you so much! Your quilts are such an inspiration!! I would like to know, too! I want a queen sized quilt. Did you find out anything? Are you only top stitching in the ditches of your seams or are you also doing other top stitching? I would love to know how the quilt was assembled. Also, do you top stitch all the same direction or reverse on each row? Thanks for the help!!! Planning to make my first strip quilt soon! Does it matter what kind/brand of fabric is used for the strips? Also what kind of batting do you recommend using? Can you tell me how I would make strips wide enough for a king quilt, since the strips have to be cut selvage to selvage , rather than lengthwise? Also, what’s the best way to cut the strips , as to get even consistent strips? Thank you! 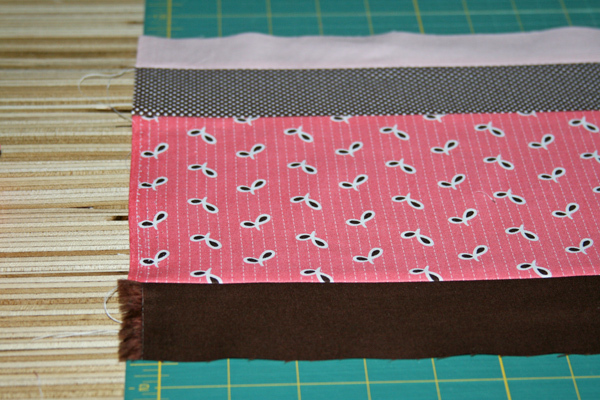 Would you add just a binding to a strip quilt or a border or two and then the binding? I just came across this tutorial, thanks! I am new to quilting, and thought I’d make a strip quilt to practice various machine quilting techniques in each strip. I was thinking I’d stitch my strips directly to the batting and backing, and then machine quilt each strip. Would this work? how did you measure the strips in width you said between 1 1.4th and 6th inches. What did you use? this will only be my second quilt ever so i am unsure. i did a square block quilt first and just bought the plastic squares to use. obviously that won’t work so what do you recommend? Hello. Would you tell me about how much of each fabric you use? Looks like only a couple of strips per. (This will be my second quilt ever!) Great tutorial. Thank you for making it approachable. Hello. I love the quilt and the tutorial. I am looking for beginner quilts as I am teaching my 6 year old granddaughter how to quilt. She has made one that was just simple blocks sewn together and then tied, but I wanted a different pattern that she could machine quilt. This one definitely fits the bill. Is this machine quited?. What do you use for batting? Do you need a wwalking foot? I never know which way to iron my seams. Should I press them open or in one direction? If one direction, which way? Towards the bottom or top? if you have a 8 inch stripe is it necessary to sew done the middle or ok to just finish it that big when you are just quilting in the ditch?